Our bare shaft ISO end suction pumps and parts are sourced locally and from world class overseas manufacturers. PumpEng® offers you full overhaul and rebuild facilities for our entire range. Programmable Logic Controlled test facility ensures accurate measurement of all operating parameters. Each pump we rebuild is fully function and performance tested in our laboratory to ensure that when you install your pump it will work first time every time. All pumps new, repaired and or refurbished are tested to AS2417 specifications. Programmable Logic Control data sheets for individual Raptor® pumps are logged and packed with the pump so you know exactly how that individual pump performed under AS2417 testing. 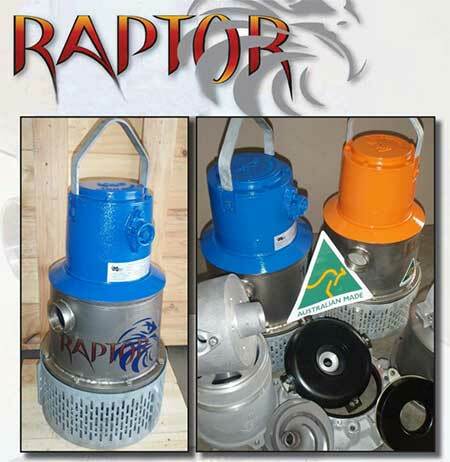 The Raptor® submersible de-watering pump is available in the most commonly used underground mining sizes. The 5kW, 8kW and 20kW have parts that are fully interchangeable with the Flygt Bibo range of pumps. SureSeal® End Suction ISO pumps provide users a good quality pump available in most materials preferred by the mining industry. Its innovative and patented seal system enables the pumps to continue operating whilst the pump is scheduled for routine maintenance. You no longer need to shut down your pump at inconvenient times when the mechanical seal has failed. Our Series 1 End Suction Centrifugal pump provides a price attractive water pump. Parts are interchangeable with the AJAX IS Series. PumpEng through consultation with the Australian Mining Industry now introduces its new range of Submersible Slurry Pumps, the “ScatPump®”. PumpEng through consultation with the Australian Civil & Mining Industry now introduces its new range of Dirty Water Submersible Pumps, the “CorroTuff Pump®”.